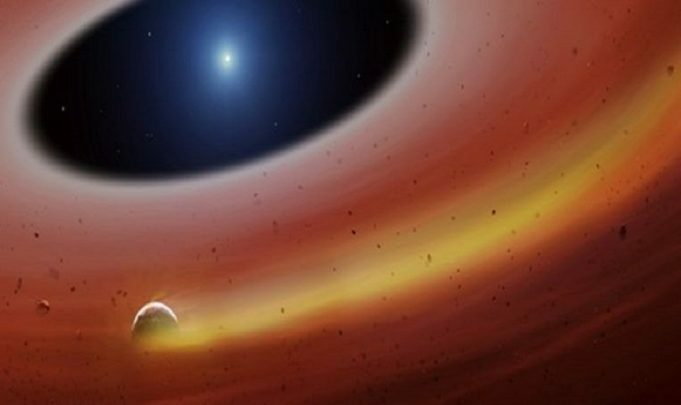 In the ‘rubble’ around a white dwarf star, a small object has been discovered that may be the remnant of a planet. The asteroid-sized object revolves around the compact star at a distance of only 500,000 kilometers and has an orbit of just over two hours. Astronomie reported this today under the authority of the scientific journal Science. White dwarfs are the compact remnants – In fact, the collapsed cores – of sun-like stars that have used up their nuclear fuel reserves. Towards the end of their existence, such stars swell and eventually blow their outer layers into space. During that process, planets that are too close to their star may die. This creates a disc of fine and coarse rubble around the former star, which is then not much larger than the Earth. An international team of astronomers examined the spectrum of the 410 light-years distant white dwarf – SDSS J1228 + 1040 – In the spring of 2017 and 2018 with the Gran Telescopio Canarias on the Canary Island of La Palma. In that spectrum the scientists found small, regular fluctuations caused in the spectrum of the dead star. This was not about a Doppler effect caused by a rocking movement of the star, but about a periodically occurring variation in the intensity of a specific spectral line. An analysis shows that these fluctuations are probably due to a small celestial body – an “exoplantetoid” – that leaves a long trail of gas. That gas can come from the object itself, but also from evaporating dust that is released during collisions with smaller debris. The now discovered asteroid would revolve around the white dwarf within that disc. Given the small distance to the star, it must have a fairly high density, because otherwise it would have long since succumbed to the strong tidal forces on site. Probably the planet consists largely of iron and nickel. The object would be at least four and at most six hundred kilometers in size.